“Yes.” His eyes still haven’t moved. “Yes.” Anger is creeping into his voice. “Yes.” The anger is more noticeable. He breathes out slowly to calm himself. It doesn’t work. “No.” Ink is seeping onto the empty page. The year 2048 is considered by some to be a binary millennium (100,000,000,000). I may even have finished my novel by then. I’ll remember that when I’m… 94! Maybe. I studied maths at university, but I don’t think I ever heard of a semiperfect number or several of the others. 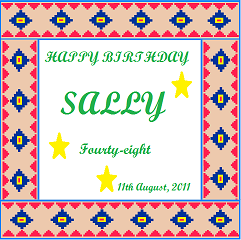 Happy birthday, Sally. All that maths has hurt my head. Is 48 really that versatile?